Through video lectures, text study, and lively group discussion, we are pleased to bring the world-renowned faculty of the Shalom Hartman Institute to you this fall. “iEngage: Israel’s Milestones and Their Meanings” explores the pivotal events of 1917, 1947, and 1967. As we look to Israel’s future, we need to engage anew with our past and explore its meanings and consequences. This iEngage series grapples with the different ideas and values that shape the meaning of modern Israel, and Zionism today. Together we will engage in a new values-based discourse about Israel, including topics such as: nationhood, land, Sovereignty, Jerusalem, Occupation and Moral Red Lines. 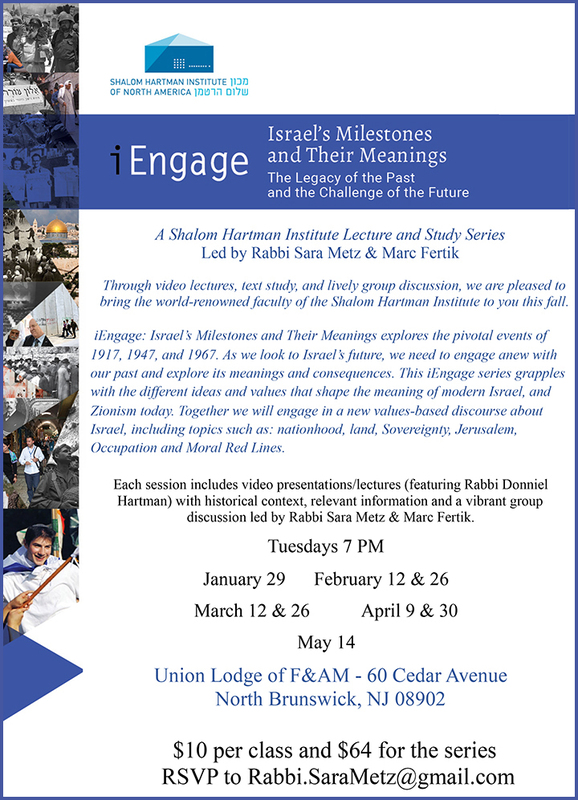 Each session includes video presentations/lectures (featuring Rabbi Donniel Hartman) with historical context, relevant information and a vibrant group discussion led by Rabbi Sara Metz & Marc Fertik. NOTE: We have the videos from the previous sessions. Contact Marc Fertik (marc@fertik.net) if you are interested in a catch-up session, or just want to view the videos you missed. Though catch up is not required. Centered on particular milestones in Israel’s modern history, each class is self-contained. This series has moved to Beth Mordecai. We meet approximately every second Tuesday. March 12, March 26, April 9, April 30 and May 14. $10 per class. RSVP to Rabbi.SaraMetz@gmail.com. USE BUTTON ABOVE TO PAY $10 PER CLASS, per person. Please enter amount ($10 or multiples of 10) and note which date(s) you are paying for. USE BUTTON ABOVE TO PAY $64 FOR THE ENTIRE SERIES.